Then it changed to 20,000 Model 3's in December. Actual production: 2,424 during full Q4 2017. It then changed to 5,000 per week target for end of Q1. Yet again revised to 2,500 per week. Tesla missed the mark producing only 2,020 per week at the end of Q1 - a far cry from 20k a month promised for December 2017. Many more examples of Model 3 madness but we would be here all day. 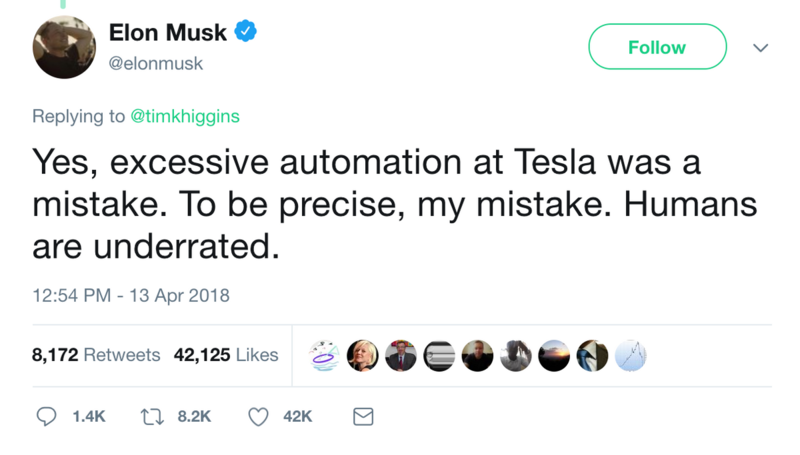 Elon promised a "machine that produces the machine". This was supposed to revolutionize the way we make cars. "You can't have people in the production line itself, otherwise you drop to people speed. So there will be no people in production process itself. People will maintain the machines, upgrade them, and deal with anomalies." Fact - there are still many employees on the production line. We're still at people speed. In the 2016 Q1 Update letter, Tesla said, "Our objective with Model 3 is to create the world's best car with a base price of $35,000." 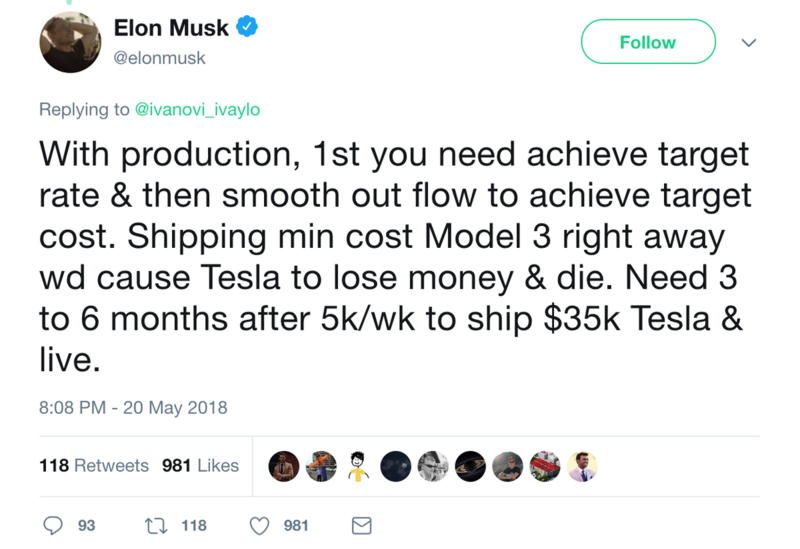 The 35k price tag has been the big selling point but Elon said the company would go under if they produced it. Many customers have placed a deposit thinking they will be able to order a $35,000 car. Will we ever see one? This tweet all but confirms we won't. February 2018: "[We] expect the new automated lines to arrive next month in March" to reduce Model 3 "bottlenecks". 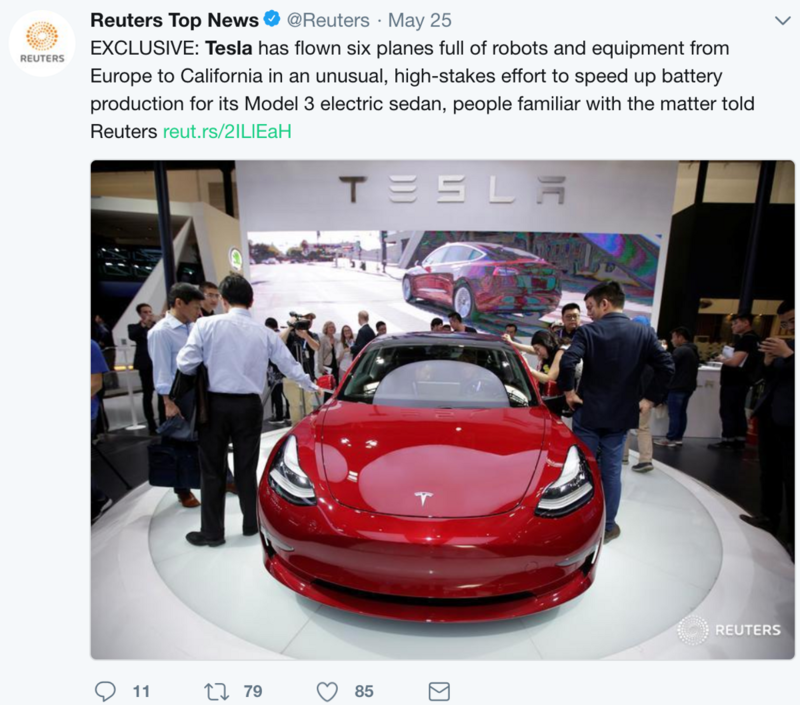 Reality: Tesla had to pay to fly 6 planes halfway around the world to get the equipment in May. Most auto companies plan their factories years in advance of production. Must have been cheap?